What station is this? And where was it from? The clue is in the logo (kinda). But no… that was C93FM. Oh, I forgot the C in front of it! 4MMM have had quite a few variations on their on air ID. Triple M FM104 is a new one for me. then back to Triple M again as it is today. 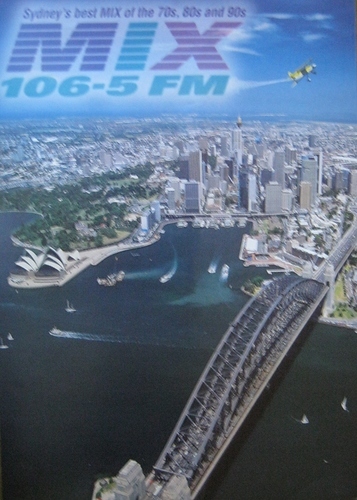 What station in Australia has gone through the most number of format changes? 3AK during the 80s and 90s would probably be up there. It’s only once it became SEN that it settled on a long term format. Earlier, there were a few Australian stations with jingles from PAMS of Dallas. JAM bought PAMS’ jingles so a lot of especially classic hits stations have modernised reworked versions e.g. WCBS-FM jingles sound a lot like vintage 77 WABC. I recall some weather beds that someone posed being used by 2SM that sound like PAMS. One of the best parts of AM DXing was to hear the jingles from US stations. 4IP and no doubt 2SM had the fantastic plastic. The great JAM jingles of KOST FM Los Angeles. Some inspiration for some early branding of ABC Gold Coast that copied some elements. KOST - The station that’s coasting for SoCal liberals. I’ve never thought much of PAMS/JAM jingles… they all sound the same. 2UE’s Rhythm of the City package was American and sounded great but I don’t think it was PAMS or JAM. Australian jingles produced locally were generally superior… the classic 2SM City Rhythm package which was used by almost country radio station stands out as does their Rock of the 80s set which I believe was also local. They sound a little dated now but 2SM had some Australian-made jingles in the 80s. I can clearly hear Mark Hunter’s voice on several of these. Mark was the lead singer of Dragon. It’s only a number and two letters - 2SM - but it sounded much better when the jingles originated in Australia and not a studio in Dallas. What was the last song played on 2UW? And the first on Mix 106.5? Cant remember the last but remember the first on MIX 106.5. Ace of Base, all that she wants. It was the most uninteresting launch ever. It was like 7am saturday morning. You probably right. I cant remember, I should call him on 2gb to ask. The early concept of Mix was a brilliant idea. I remember tuning into Mix on that Saturday morning. 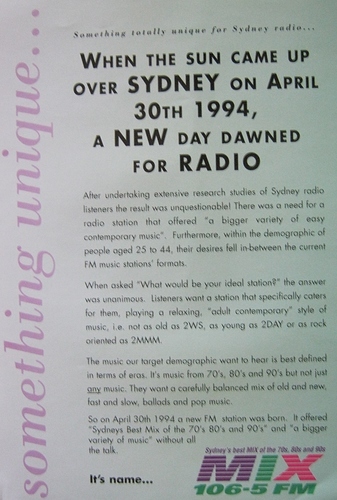 To me it sounded like the original 2DayFM but without the class. I thought it was more like Sydney’s Boring Mix of the 80s and 90s. 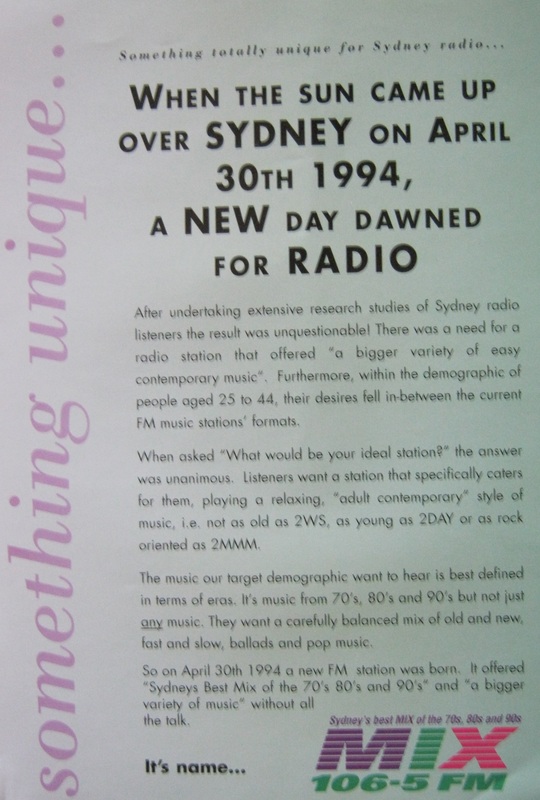 In its later years it had a new breakfast show every year, a little like modern day 2DayFM. I never listened to 106FIVE very much - until KIIS launched. Thanks for posting the ad though. The ad made the station sound better than it was in reality. The copy is almost the same that was used for the launch of smooth almost 20 years later. It never had huge success MIX 106.5. It was too repetitive, those MIX artists how can we forget. Even George Moore hinted on his current show now he got sick of playing the same songs. Mike Carlton felt out of place doing breakfast. My view smooth has had better success. There was one or two exceptions, I did enjoy way back Wednesday (I am not sure if it was popular but I enjoyed it), where they played 70s and 80s hits all day. Also the love god had good success but it was not my cup tea back then. With a bit less repetition in the playlist, I’d probably say that the original music format(s) of Mix 106.5 would’ve enjoyed more ratings success had it been on the air sometime in the last five years or so, rather than during the 1990s/2000s. Mind you, I’m sure ARN would vastly prefer both of their Sydney stations to be in the ratings positions they’re in right now (or have been more recently) compared to how they were about 15 years ago.